From cantaloupe, honeydew, watermelon, and more, melons are large, tasty fruits that are grown all around the world. Melons belong to the Cucurbitaceae or gourd family, and are believed to have originated in Africa. Melons prefer warm, dry environments, so growing them in cooler climates can be a challenge. However, if the right conditions are met and these simple growing guidelines are followed, cultivating sweet melons at home can be an easy task. Melon plants grow best in well-drained soils, rich in organic matter. Perform a soil test before planting, and amend appropriately with compost or manure. The designed area for planting melons should be warm and sunny. A black plastic or fabric row covers can be used to keep the soil warm. 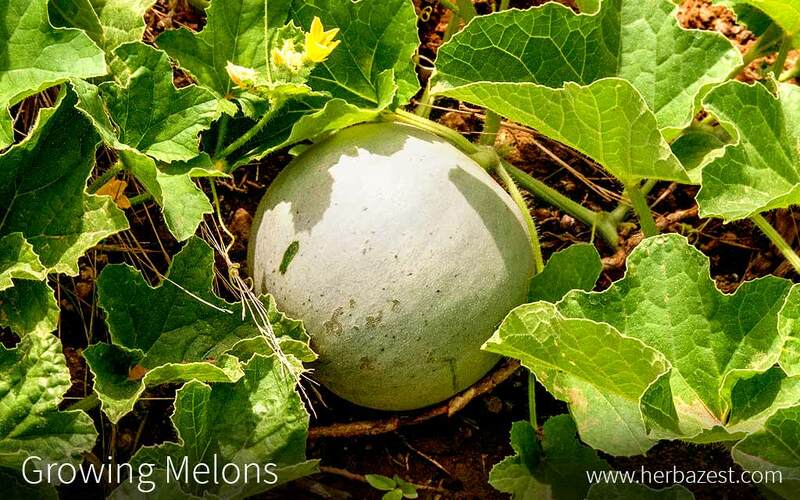 If planning to grow melon in a region with long, hot days, melon seeds can be sown directly into the ground, in groups of two or three, on raised mounds, and at approximately 0.5 - 1 inch (1.3 - 2.5 cm) deep. Melon plants have both male and female flowers. It is important that the flowers are well-pollinated to ensure a good fruit set. This process can done by hand. However, most often bees help pollinate flowers. For that reason, it is not advisable to use pesticides on melon plants. Alternatively, melon seeds can be started indoors, in seed trays, two to four weeks before you intend to transplant them. The seedlings will be ready to be moved outdoors when they have well-developed roots and two to three mature leaves. It is recommended that melon plants receive between one and two inches (2.5 - 5 cm) of water per week. It is important to water deeply and evenly the melon plants. If possible, employ drip irrigation. Watering must be reduced as the fruits begin to ripen, as this will help to improve their flavor. However, regular irrigation still necessary, especially in the last two weeks of growth, to ensure proper development of the fruit. A soil test must be performed before planting melons. If necessary, organic matter can be added. The use of manure or compost may help reduce the need for fertilizers. However, melons are heavy feeders and timely fertilizer applications can significantly improve the quality and quantity of the fruit. If the soil has high levels of phosphorus, use a low-phosphorus fertilizer. Since the roots of melons are close to the surface, weed control should be performed carefully by shallowly cultivating the soil. However, as the vines begin to grow, it is better to pull weeds by hand. Alternatively, it is recommended to mulch around melon plants. A dark mulch will keep warm the soil, allow moist retention, and control weed growth. There are few insects that are known to damage melon plants. These include squash bugs, which feed on the melon foliage; squash vine borers, which chew through the vines; and cucumber beetles, which eat the stems, leaves, and fruit. To control squash bugs and squash vine borers, remove the insects from the plants by hand or apply appropriate pesticides. It is also recommended that you bury or compost all plant residues after the harvest season. This will help control further infestation. The use of a floating row cover or fine netting can prevent damage caused by cucumber beetles. If planted in cold, wet soils, melon seedlings may be susceptible to damping off. Moreover, melons are sometimes affected by fungal diseases like powdery mildew, and leaf spot. These diseases typically affect the leaves and vines of the plant. To prevent fungal infections, melons should not be planted in areas that have hosted members of the squash family within the last three to five years. Additionally, soaking the foliage when watering must be avoided. Knowing when the melon is ripe to pick will depend on the variety. Cantaloupe typically matures 35 - 45 days after flowering. A coarse, dull brown skin surface, with tendrils near the stem dry out and turn brown, indicates that the fruit is ripe. When watermelon or honeydew is ripe the tendrils near the stem turn dry and brown, the fruit surface becomes rough and dull, and the bottom changes color from light green to yellow. Not all melons will ripen at the same time. For that reason, they should be harvested as they become ready, by twisting the fruit so that is separates from the vine. Melon fruits should not be allowed to separate themselves from the vine. Cantaloupe will pull from the vine much easier than other varieties of melon. Melons can last two weeks or longer if stored at a constant temperature between 45 - 50°F (7 - 10°C). They should not be stored below 45°F (7°C), except for the netted melon variety.